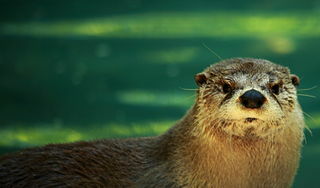 An otter with selfish genes? I’ve just come across a on-my-first-impression fascinating online magazine Aeon with quite a few articles worthy of comment. One that garnered its fair share of discussion was ‘Die, selfish gene, die‘ by David Dobbs arguing that Richard Dawkins’ concept of the selfish gene is no longer useful with the growing awareness of the importance of epigenetics. Dawkins himself entered the fray. A follow-up post by four ‘expert witnesses’, ‘Dead or Alive?‘ tries to take the issue further. I remember as a teenage atheist devouring The Selfish Gene with delight. I loved the topsy-turvy clarity of the idea that genes were the things that mattered with bodies they built being vehicles for their survival. There is more than science here: there is a story or a world-view with a distinct flavour (to mix the metaphors thoroughly!). I had already devoured E. O. Wilson’s ‘Sociobiology’ in my quest to naturalise ethics and do away with the need for God but Dawkins seemed to take the story further. Wilson’s ‘story’ was of a messy, complex, burgeoning world with selection at many levels — a world with colour and detail. As I remember heaving the book’s weight about I seem to get the scent of green undergrowth. The Selfish Gene ‘smelled’ by contrast cold and sharp, maybe metallic; the world it portrayed counter-factual and abstract, populated by ‘replicators’. I lapped up the austere vision. I have Dawkins to thank I think for my eventual religious conversion for finally the bleakness I absorbed from his book pushed my atheism to the breaking point. And there I met God. It took a few such encounters before I did something about it. Wilson’s ‘greener’ world-view might never have pushed me hard enough. These days I am fascinated by the stories told by biosemiotics as an alternative to the prevailing paradigm of evolutionary biology.